Kind of a crazy question, you might well think. What do street intersections have to do with strong neighborhoods and empowered citizens? Aren't intersections just for dividing up blocks, and getting traffic through? Yes, you're right -- at least for now in most places. 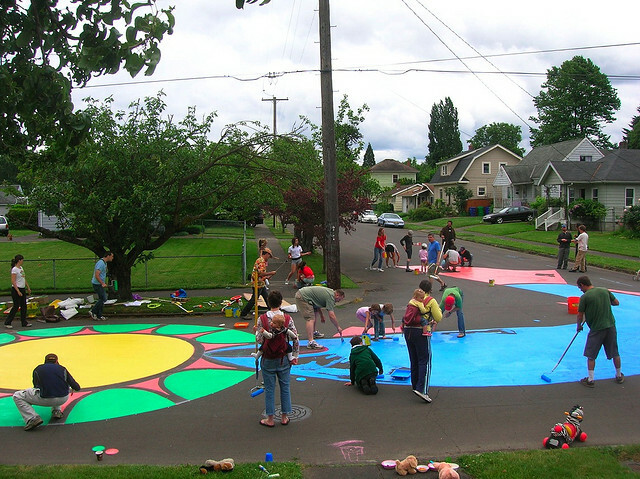 But in Portland, Oregon, thanks to dozens of volunteers working for a nonprofit called City Repair, and thousands of citizen participants, intersections have become the place to be. What's more this intersection transformation, which I'll soon explain, is spreading to other cities across North America. Mark Lakeman, outside his office. I sat down at Riyaddh's, a terrific Lebanese Restaurant in the city's Hawthorne neighborhood, to talk with architect Mark Lakeman, who helped found City Repair back in 1996. Lakeman's office was just steps away from Riyadh's and a cluster of other restaurants and food carts. 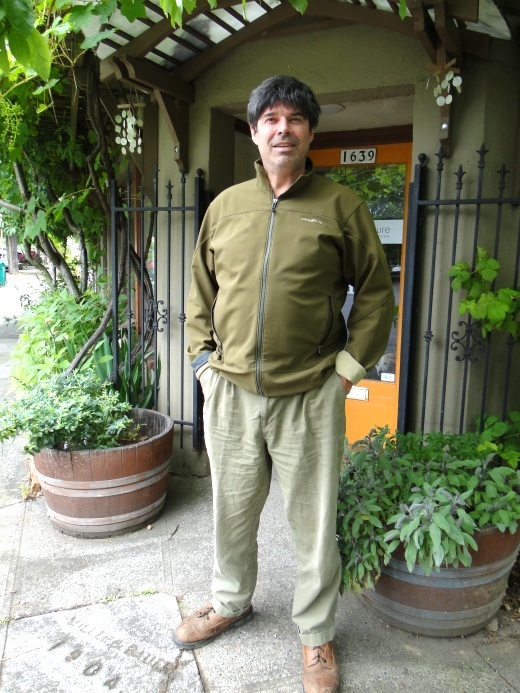 Lakeman, who grew up in Portland, spent seven years traveling in Africa and other parts of the world. As he described it, the morphology of African villages, with houses clustered around a common community space, made for more cohesive communities -- places where neighbors regularly interacted with each other. In his travels and studies, Lakeman came to realize the importance of village squares, plazas, zocolos, whatever they may be called, in the midst of where everyone lives. Compared to the rest of the world, the U.S. had few such neighborhood gathering places. Lakeman believes that part of the reason lies in America's adoption of the grid street pattern, following the model of the Northwest Land Ordinance of 1785. The grid made the city into a commodity for sale piece by piece, while intersections cut off neighbors from easy contact with each other. But, with a stroke of insight, Lakeman decided to turn intersections on their head, so to speak. The idea was simple: let nearby residents take control of their intersections. photo by City Repair; Flickr creative commons. then, if you like, furnish them with homemade benches, lending libraries, kids play areas, and even "T-stations." Note from PlannersWeb Editor Wayne Senville: Some photos I took while visiting Portland's Sellwood neighborhood to see the original intersection repair — called “Share-It Square” (a play on both the name of the intersection: 9th & SE Sherret Street and the key idea of neighborhood sharing). You can spot me sharing the bench with Molly Krumholz (daughter of our general manager, Betsey Krumholz) who is a student at Reed College and lives nearby. Checking out the "T-Station" are Molly and my spouse, Lila Shapero. In other words, as Lakeman described, "make people realize that their streets and intersections don't have to just be thoroughfares for traffic, they can be community gathering spaces." OK, that all sounds logical. But -- really -- what city would allow something like this, and what residents would even want to be involved? Lakeman, however, was counting on two things: a knowledge of how Portland works, and an understanding of what people want. So how did local activists convince city leaders to get on board with the idea? First of all, said Lakeman, "in 'selling' the program, we looked to local benchmarks that everyone agreed with -- engaging youth; traffic calming; strengthening neighborhoods -- and showed how 'intersection repairs' would help with each." They strengthen neighborhood by giving people a place they've created, designed, and now "own." Second, Portland, as Lakeman put it, has a history of "insurgency planning." He spoke about the creation of Pioneer Courthouse Square in the heart of downtown -- where citizens and planners, in effect, demanded that a parking garage be torn down, and that a public square be created. In fact, Mark's father, Richard Lakeman, who headed Portland's urban design division at the time, was instrumental in this. As Mark described it, "one weekend people came downtown and painted the roof of that parking garage; it was a symbolic catalyst." Whether by coincidence or not, the neighborhood intersection repairs also draw on the power of paint. Intersection Repair from Streetfilms on Vimeo. 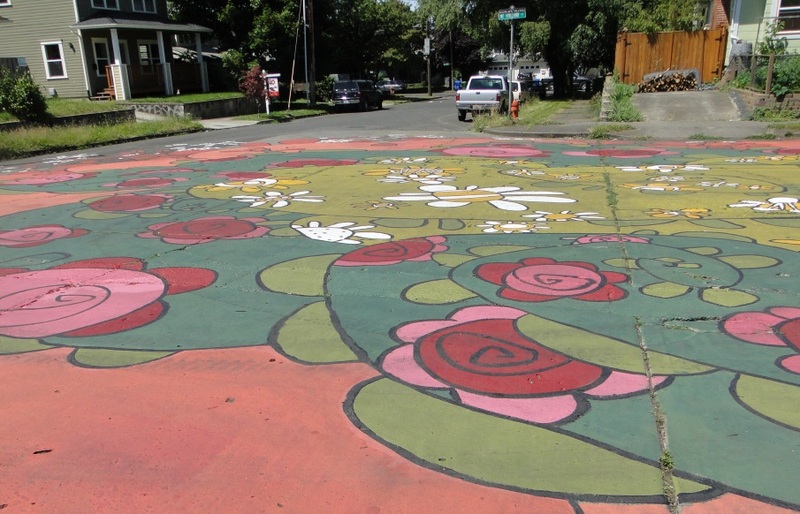 The first intersection repair, as it was called, took place in 1996 in Portland's Sellwood neighborhood -- where Lakeman grew up. The next, a few years later in Sunnyside (an intersection our First Stop Portland guide proudly showed off to us, you might recall). 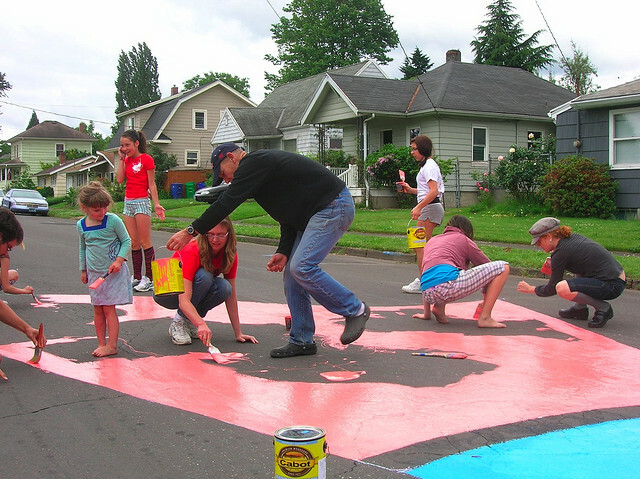 Then, in 2001, the Portland City Council passed an ordinance formally acknowledging citizens' right to paint and furnish intersections in their neighborhood -- subject to a few common-sense guidelines. And, yes, cars can still drive through the intersections after they've been "repaired." The two streets must be classified as Local Service Streets and carry less than a combined 2,500 vehicles on an average day. The support petition must have signatures from each of the adjacent residents and at least 80 percent of the residents on the project street frontage(s) within two standard city blocks of the proposed project. The applicant for a permit must provide the City Traffic Engineer with a written description of the proposed changes, including diagrams depicting how the intersection will look when completed. The permittee shall maintain, at no cost to the City, all aspects of the project during the term of the permit. Download the ordinance (as a Word document). As Lakeman told me, even local transportation engineers enjoy the intersection repair projects -- they're something that's actually fun to help residents out with! But the initiative for doing an intersection repair remains with residents of a neighborhood. They must initiate the project, demonstrate widespread community support, and do the work (though City Repair offers technical and logistic help; and local businesses usually chip in for needed materials). Time also must be spent on reaching consensus on the intersection's design. Intersection design for 8th & NE Holland in Portland, Oregon. photo by Wayne Senville. That's a good thing, Lakeman explained. "It's important for citizens to develop design literacy, and cultivate an appreciation for the value of design." Today, several dozen "intersection repairs" have taken place across Portland. What's more, the idea has expanded to other cities -- Tucson, Asheville, Cincinnati, Philadelphia, and Ames, Iowa, to name a few. In Portland, there's also now a week every spring when an event called "Village Convergence" occurs. 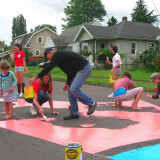 Residents from across the city go out and repaint their intersections, or work on new ones and other neighborhood-building projects. You can get more information -- including a guidebook and DVD -- from City Repair. Then go out and recruit some of your neighbors, and get some paint! p.s., I was originally going to meet Mark Lakeman "in the field," but his time was scarce as he needed to spend the rest of the day working with a group of school kids from New York City who were in town to learn how to build outdoor cases for lending libraries, and then install them across the city in front of the homes of people willing have them in their front yard. In the next post, I'll (more briefly) report on another way in which Portland residents have taken control of their neighborhoods. 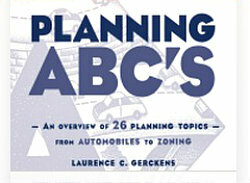 In prior years, we've also talked in the Planning Commissioners Journal and on PlannersWeb.com about other ways of building community -- while getting some great things done: such as developing a greenway system, or renovating a shuttered historic theater.